3. 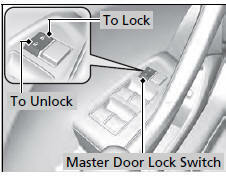 Unlock the driver’s door using the master door lock switch. - The fuel fill door on the outer side of the vehicle will unlock. 4. 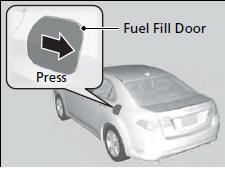 Press the area indicated by the arrow to release the fuel fill door. You will hear a click. 5. Remove the fuel fill cap slowly. If you hear a release of air, wait until this stops, then turn the knob slowly to open the fuel fill cap. 6. 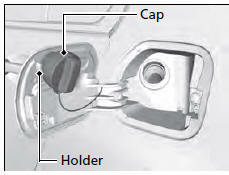 Place the fuel fill cap in the holder. 7. Insert the filler nozzle fully. 8. 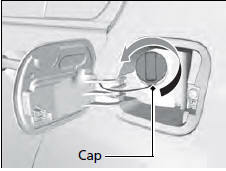 After filling, replace the fuel fill cap, tightening it until you hear it click at least once. The vehicle doors and fuel fill door automatically relock if the remote unlock function is used. This can be deactivated by briefly opening then closing the driver’s door. The fuel fill door and its latching mechanism can be permanently damaged if the fuel fill door is forced closed when the driver’s door is locked.